The perfect way to meet newcomers and old timers in small, convivial groups! ❖ Six months of the year (October, November, January, February, March and April) you share a potluck meal with a small group of friendly UUs in someone’s home. Once a year you host a group. ❖ The Fellowship Dinners coordinator sends a list of guests to the host, who contacts the guests, establishes a mutually agreed date for the meal, and prepares the main dish. ❖ The guests bring the rest of the dishes for the meal: appetizer, salad, vegetable, dessert, beverage, etc. ❖ Be creative and carefree! The Fellowship Dinner can be a dinner, or it can be a breakfast, brunch, lunch, or picnic! Do I have to be a gourmet cook? You can join in Fellowship Dinners even if you bring a dish from the deli. What if I am not part of a couple? Single or paired, you are welcome at Fellowship Dinners. What if my house and table are small? 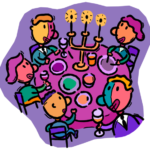 Fellowship Dinners can be for as few as 4 guests. On your Registration Form note the number of guests youcan accommodate. Some folks with small or distant homes might make arrangements to host in someone else’s (larger, closer) home. Hosting UUs is an enjoyable experience; however, you don’t have to host if you have limitations that cannot be overcome. Let the coordinator know that. Will I eat with the same people every month? 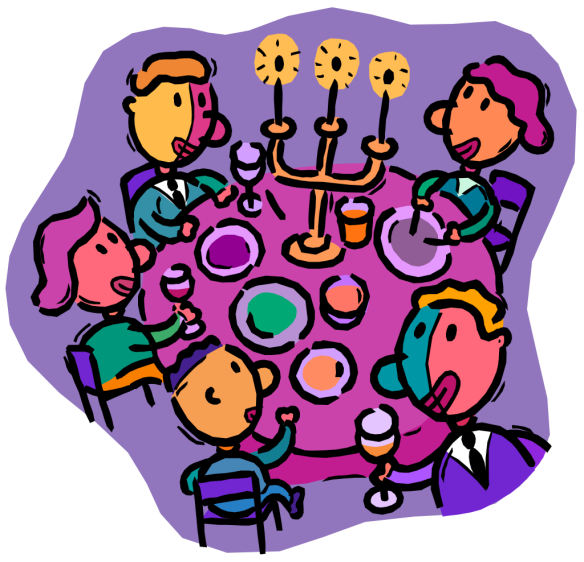 One of the great attractions of Fellowship Dinners is the chance to meet a different group of UUs every month. What if I cannot participate every month? When you register, mark the months you cannot participate. Click here to sign up online! You can also pick up a paper form at the church and leave it in the office (Room 204). May I still enroll later in the year? Yes. Just send in the form as soon as you can.